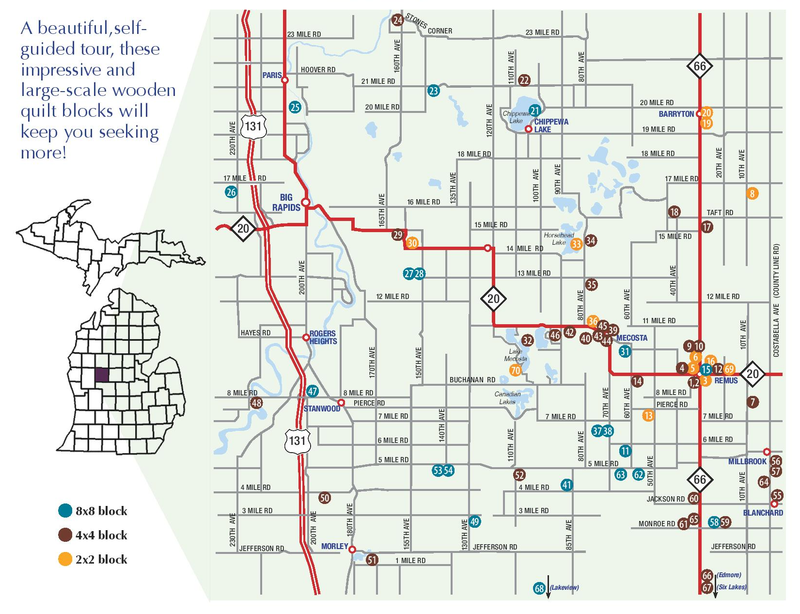 Artworks is a nonprofit organization focused on keeping the arts scene thriving in Mecosta County. The organization offers educational programs, summer art camps, a foreign film series, book clubs, and other ways to get involved in the creative community. Its downtown venue is home of its art gallery, which features rotating exhibits throughout the year, and The Painted Turtle, the gallery’s gift shop featuring goods made by local artisans. Each February, Big Rapids Festival of the Arts brings a month-long celebration of the arts to Mecosta County, just in time to cure our collective winter boredom. Each day of the month, at least one concert, play or visual arts demonstration is presented to the public for free. A new calendar is released annually in January and can be found at brfota.org. Canadian Lakes Men’s Chorus isn’t known for any single style of ensemble performance. The choir, composed of men from Canadian Lakes and Big Rapids, is known to perform a variety of songs, ranging in style from religious to patriotic to old-fashioned barbershop tunes. They perform at events throughout the year. Whether you’re looking to fix your broken guitar or take up a career in lutherie, Galloup Guitars has something to suit your need. The shop specializes in custom orders of new guitars and repairs for those its customers already own. The school has masters, journeyman and technician programs for those looking to take on the craft of guitar-making as a profession. 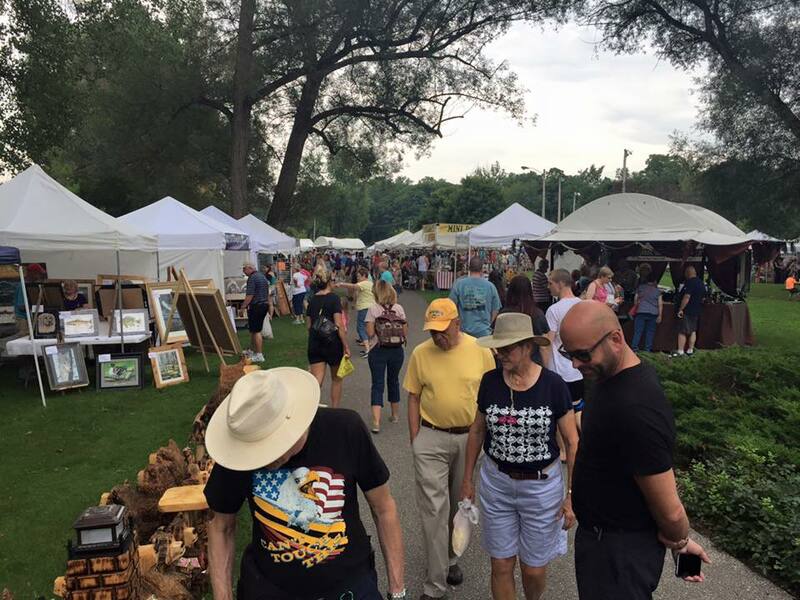 Now in its 50th year, the Labor Day Arts and Crafts Fair is hosted by the Chamber of Commerce every year on Labor Day in Hemlock Park in Big Rapids. The craft fair welcomes artisans from all around Michigan to sell their handmade goods in the park along the river, and it is one of many events that take place during this end-of-summer holiday weekend in Big Rapids. To sign up to become a vendor, click "Chamber Events" under the "Events" tab above. Tuba Bach is committed to keeping music performances accessible to all audiences. Each fall, the organization hosts a free concert series that invites world-renowned musicians to stages in Big Rapids. Musicians have come from 14 different countries, 22 states, throughout Michigan, and our local community to share their talents. The organization also engages in music education in local schools during the academic year. All the world’s a stage, and STAGE-M is the organization that keeps the community theater stage open for Mecosta County actors and audiences. Supported entirely by volunteers and low-cost ticket sales, STAGE-M produces several plays each year to highlight local acting and musical talent from community members of all ages. Summer in Big Rapids sounds like music in the air, and two small outdoor venues are where music lovers can find local talent playing for free. The Big Rapids Bandshell, located behind Big Rapids Middle School, hosts its summer concert series on Wednesdays. On Fridays, downtown farmer’s market shoppers are likely to hear music at noon in Pocket Park, where a small stage is situated between Raven Brewing and BBQ and Chemical Bank. 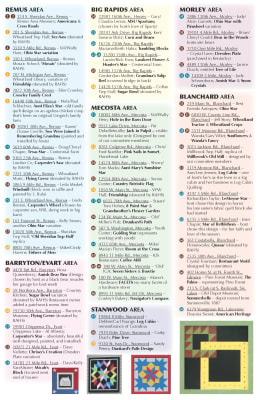 Schedules for these concerts can be found each summer at downtownbigrapids.com. The ladies of Voca Lyrica don’t just sing in Big Rapids, although they do so often and usually for free to the public. This choral group has traveled the world to sing on some of the world’s finest stages, including New York City’s Carnegie Hall and Lincoln Center, and to the world-famous Sydney Opera House. Ferris State University is most recognizable for its trades-based educational programs, but the school is also home to a surprising art collection. The university holds more than 50,000 pieces of fine art, 3,000 of which are available for public viewing. Some of those pieces are part of the Michigan Art Walk, which includes large 2D and 3D installations both indoors and outdoors on the Big Rapids campus. Inside the University Center, Ferris State’s Fine Art Gallery can be found. The gallery showcases rotating exhibits throughout the academic year, some comprised of work by students and faculty on the Big Rapids campus or from Kendall College of Art and Design, and some by professional artists from around the country. Can You Find All The Bulldogs? In 2008, 36 bulldog statues were placed around downtown Big Rapids as part of a Leadership Mecosta fundraising project called 'Year of the Dawg'. 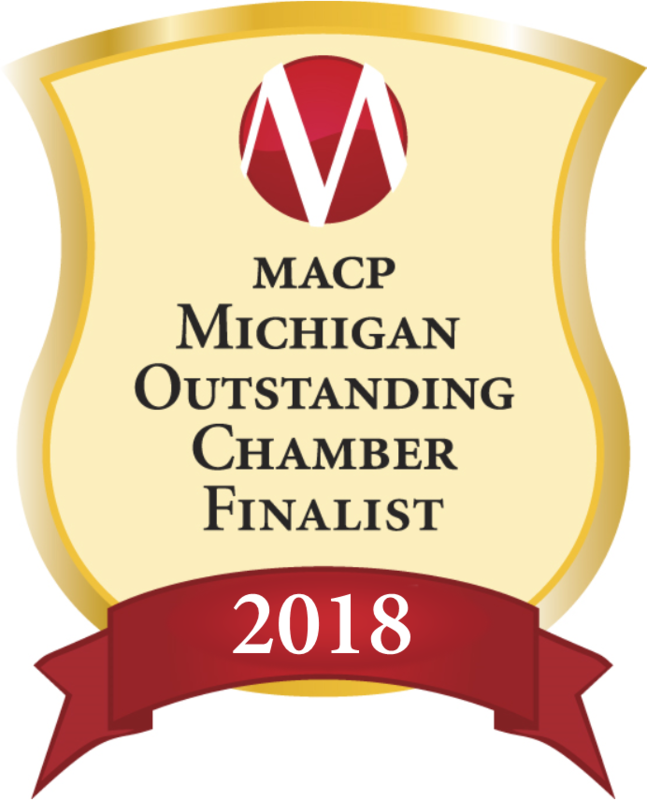 All of the money went to three organizations: Artworks of Big Rapids, the Youth Attention Center of Mecosta County (YAC), and Leadership Mecosta. Driving through Mecosta County, it would be difficult to miss the mammoth sculptures created by Mecosta-County based artist Robert Barnum. His art has shaped the county’s landscape through partnerships with local businesses and municipalities looking to enhance the local public art scene. Barnum, a professor at Ferris State University, works with his students to design and craft these sculptures. The sculptures often have stories cut into their bodies and they hold objects with significance to their surroundings. 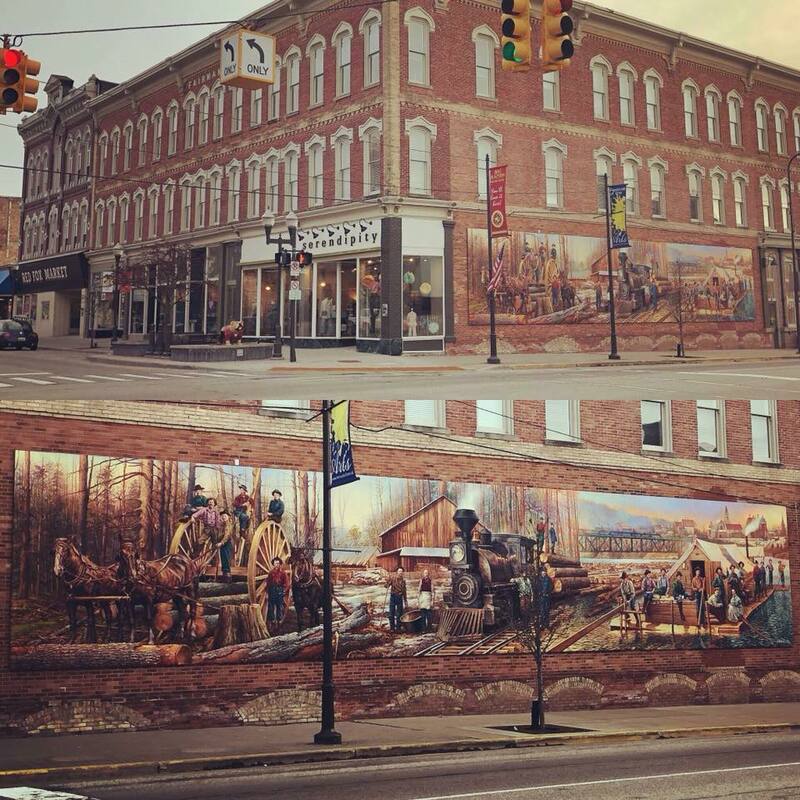 If you take a tour of Mecosta County, you're likely to spot a few murals in addition to the public sculpture collection. As part of 2018's Festival of the Arts, a new mural by John Kuna was installed in downtown Big Rapids. 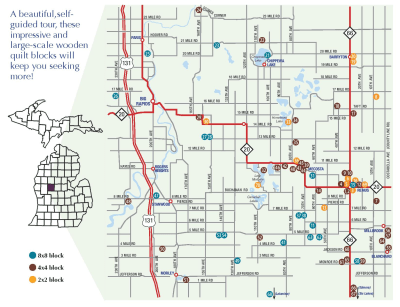 Kuna was commissioned by the 2018 Festival of the Arts committee to create the artwork, which pays homage to Mecosta County's logging history. The Festival committee has developed a tradition of giving a piece of artwork to Big Rapids after each year’s events. A mural depicting the flora and fauna native to the Muskegon River watershed can be seen overlooking the river across from Swede Hill Park. Maple Street near Third Avenue is where visitors can find a mural by Andy “Cosmo Joe” Walker that offers a cosmic interpretation of Big Rapids' landscape. Have you seen the brilliantly-patterned squares hung high on barns in the countryside? They’re part of the Quilt Trail, a grassroots public art project that began in Ohio and is working its way into many Midwestern states. 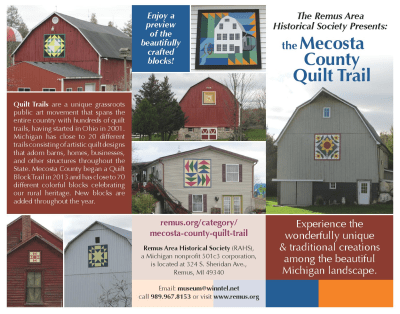 Mecosta County’s Quilt Trail has 67 quilt blocks on barns, businesses and homes across the county. Want to find them all? 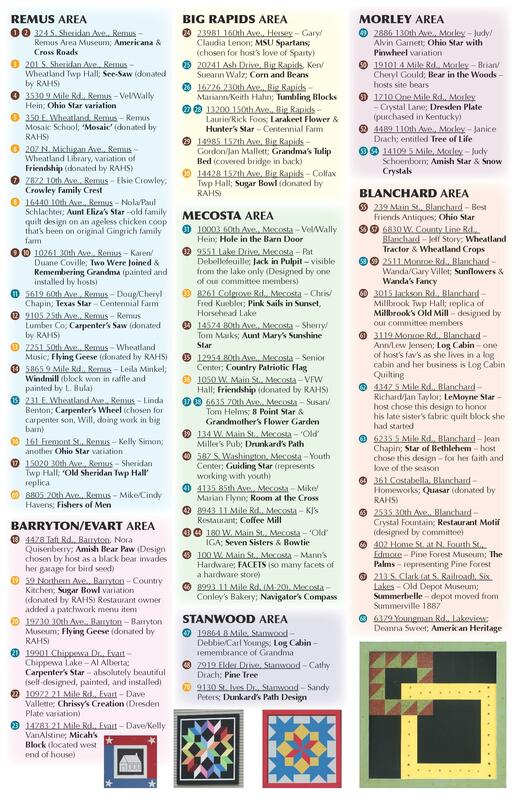 Download the map below and hit the road.